Cross that 5K off my bucket list! Today, I "ran" my first 5K. I have been setting this as a goal of mine for quite some time now, and just haven't "gotten around to it". Running intimidates me more than a lot of things. I think because whenever I run, or think about running, I always flashback to Middle School when we were doing fitness testing, and completing the mile in 12 minutes test, and having Mrs. G yelling at me to get over it and keep running, while I was dry heaving on the sidelines. I have this terrible fear that it will happen again. I'm sure that Mrs. G isn't going to magically appear where ever I am to holler at me...but she could. I've tried running plenty of times...okay five. And it usually ends up becoming a walk/jog. But I've always said to myself I will do better next time. And I think I have, maybe I need to just stick with it so I can actually track my progress. When I was on my kick about making it a goal of mine to run a 5K, the Color Run always seemed to be just my cup of tea for this task. It's objective is to have fun, not to see who can cross the line the fastest, and you end up tie died...who doesn't want to be encouraged to skip and dance across the finish line, as well as told to "drop and roll" across the color stations? So I planned to do the Color Run in DC...that sucker sold out in a couple of hours! So, I waited...and I moved...and waited some more. Finally, the Color Run was coming to Boston! 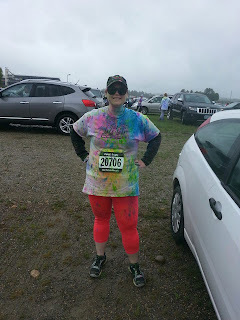 But there was no date, so I waited...Then, I saw something about the Color VIBE Run, here in New Hampshire, this was it, this was meant to be the race for me. I rallied up some friends and we signed up. Through the next couple of months my life got a little chaotic, ending jobs, starting new jobs, ending those new jobs and starting other new jobs. Needless to say I didn't exactly find time to prepare for this Color Vibe Run...all I did was download the Couch to 5K app on my phone. Next thing you know, the day is here. And it's 40 degrees and raining. I came pretty close to saying screw it and enjoy a day off curled up in my toasty warm bed. But no...I set out to accomplish this...and by golly I'm gonna do it! So, I layered up, picked up my sister and away we went. We were able to meet up with some friends and start the race together, and quickly separated. My awesome sister stayed with me the whole time, we ran a little and walked a little then ran some more. It went by a lot faster than I had expected. 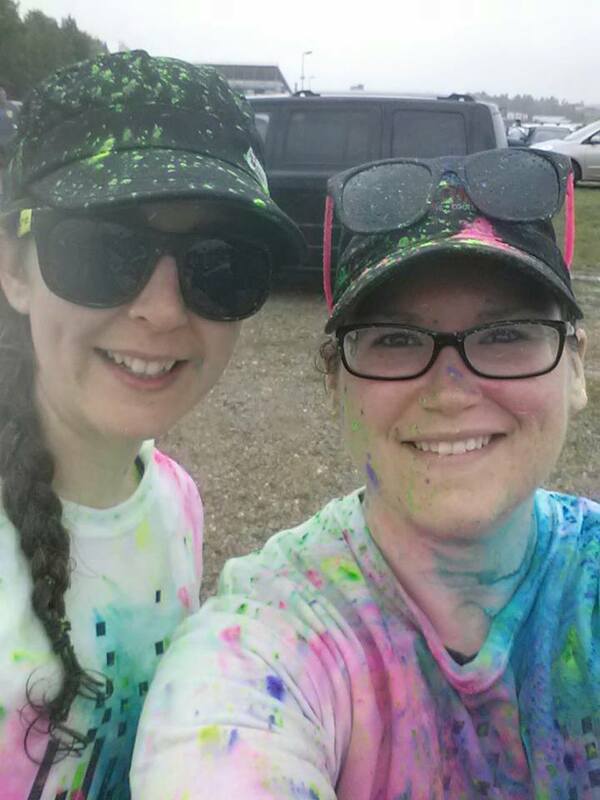 I wish that the weather had been nicer, by the time we were done the race we were drenched, in rain and in color, and freezing. We had fun though, hopefully next time (that's right, I said next time!) it will be nicer weather so we can actually enjoy ourselves and not just run to get it over with! Next time, I will try to prepare more though, even though we did well, I would have felt much better about myself if I had been able to run the whole time. But, 2 years ago....I would have barely made it just walking! Hi Sarah! Glad to have stumbled upon your blog! I was wondering if you feature guest postings. Thanks and have a great day!